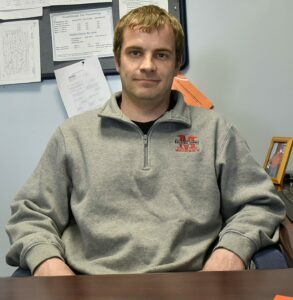 Matthew Rewa, 34, began on Monday; he will transition to the town's main code enforcement officer after Paul Mitnik, who currently holds the position, retires within the year. CHINA — Matthew Rewa spent 13 years as a self-employed builder. Now, he’ll be issuing permits for anyone hoping to build on China land. Monday was Rewa’s first day as the municipality’s assistant code enforcement officer. Town Manager Dennis Heath introduced Rewa at a Select Board meeting on Monday night, adding that he’d been given “a firehose education — a lot of information all at once.” Though the board unanimously authorized Rewa’s hiring in executive session on March 18, Heath said he did not want to disclose Rewa’s name until he had accepted the position. Rewa will be assisting China’s Code Enforcement Officer Paul Mitnik until he retires, which Heath said would likely be in December. After that, Rewa will become the town’s main code enforcement officer. Seven other candidates were considered for the position, according to Heath. “They were from varying distances around the state, as far away as an hour and as close as China,” said Heath. One other candidate who lived in China withdrew an application after being interviewed, he noted. Rewa will work 24 hours a week — Wednesday through Friday — until July 1, at which point he will start working 40 hours a week. Heath said that the majority of Rewa’s $18 hourly rate through the end of this fiscal year is coming from the amount allocated for Heath’s insurance, which was unspent because of Heath’s military coverage. His proposed salary, in the 2019-2020 budget is $59,942, which includes benefits and reflects an increase to $19 per hour. Mitnik is currently paid $33 per hour and works 26 hours each week. The proposed wages and benefits for Mitnik in the upcoming fiscal year are $26,163, which lasts through Dec. 31, according to Heath. Rewa has never held a municipal role before, but said he heard about the job from a contractor he subcontracted work from in the past. “I just took it on more or less because I’ve been doing a lot of physical labor for most of my life, and I’m looking to lean more towards doing mental rather than physical labor,” he said. Rewa, 34, grew up in Winslow, graduated from Winslow High School and studied mechanics at Mid-Maine Technical Center. He lived in Oakland before he moved into a house he built himself in China on Jan. 1, 2016. Members of the Select Board have previously expressed a desire to get younger people interested in paid and unpaid municipal roles to replace a generation that is reaching retirement age. Selectwoman Irene Belanger voiced a desire for young volunteers in particular. Heath said he cautioned that getting younger employees does not always lead to long-term retention. But Rewa said he doesn’t plan on going anywhere soon. “I plan on sticking around with this for a while if everything works out good,” he said.